There just aren’t enough shoot ‘em ups in the world today. Sure, every now and then we get an interesting new take on the genre like Geometry Wars, or the re-release of genre classics, like Radiant Silvergun or Ikaruga, but by and large, the shoot ‘em up has become more and more niche, supported by a fairly small but devoted following. With that in mind, Sony’s decision to launch Resogun alongside the Playstation 4 seems rather… odd. Nobody buys shoot ‘em ups anymore, Sony. Haven’t you heard? And yet, Resogun is here as the first first party downloadable game on the revamped Playstation Network. However, dismissing it because of its status as a downloadable title would mistake. Resogun is an incredibly well-made shoot ‘em up that stays true to the genre’s roots while adding a few unique touches of its own. Like most games of its ilk, Resogun places you in control of a small ship and tasks you with destroying the enemies that populate the game’s various levels. And if this was all that Resogun offered – that is, if it was just another shoot ‘em up – it would probably be enough. But it isn’t. The story is a simple one: aliens have invaded and captured the last of the humans, and you need to stop them by destroying everything. "All of Resogun’s stages are cylindrical loops. This may seem complicated, but it’s actually fairly simple. Navigating your ship left or right takes you to another part of the loop, allowing you to interact with the contents of the area you currently occupy." And I do mean everything. Like most shoot ‘em ups, Resogun takes place on a 2D plane, but unlike most of its more famous contemporaries, the plane is horizontal. In an additional twist, the gameplay isn’t entirely 2D. All of Resogun’s stages are cylindrical loops. This may seem complicated, but it’s actually fairly simple. Navigating your ship left or right takes you to another part of the loop, allowing you to interact with the contents of the area you currently occupy. Of course, just because you aren’t in a specific part of the cylinder doesn’t mean that things aren’t happening within that area, and enemies are constantly spawning and moving to attack you even when you can’t see them. This means that enemies can and will come at you from both sides, so you’ll have to be quick on the stick to survive for any length of time. In addition, you’ll also have to save the aforementioned humans, who are locked in cages that are scattered throughout each stage. Each cage can only be opened by destroying specific groups of enemies called Keepers, which will only appear for a short amount of time. Failing to destroy the group of Keepers associated with a cage will mean the death of the human inside of it, which adds an additional layer of tension to the proceedings, especially when the screen is covered in enemies. Of course, merely breaking your human friends out of prison isn’t enough: you’ll have to get them to safety, too. This is made more complicated by the fact that you can only carry one human at any given time, and that humans wandering the map are vulnerable to enemies that beam them up, UFO style. "Resogun gives you more than enough tools to deal with your enemies, and save the humans, too. In addition to their standard guns, which can be upgraded by acquiring pickups that spawn in each stage, ships have the ability to boost around the level." If this sounds complicated, it’s because it is. Thankfully, Resogun gives you more than enough tools to deal with your enemies, and save the humans, too. In addition to their standard guns, which can be upgraded by acquiring pickups that spawn in each stage, ships have the ability to boost around the level. This is particularly useful for escaping from large groups of enemies, but it can also be used to ram other ships. Each ship you destroy drops green energy than can be used for your Overdrive attack, an enormous laser that is capable of destroying everything on screen if used correctly. Your ship is also equipped with a number of bombs, which will destroy every enemy on the stage when fired, even if said enemies are on the other side of the cylinder. But Resogun isn’t content to have you just stay alive and save humans. You also want to rack up a good score. Each successive kill grants points and adds to your bonus multiplier, with each individual enemy adding a tenth of a point to the latter, so it’s in your best interest to destroy enemies quickly. However, you don’t want to go too quickly. Go too long without blowing up an enemy ship, and your multiplier drops back to one. 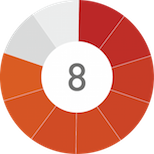 Each stage features three phases and ends with a boss battle, so managing your bombs, humans, Overdrive, and score means playing the long game. And it’s in the long game when everything that Resogun has to offer comes together. At first, I was fighting just to stay alive and rescue every human I could, but once I figured out how to manage the game’s interlocking systems, I found myself chasing multipliers, trying to rescue all of the humans (and rescue each one at the right time to make the best use of my multiplier and acquire key bonuses, like an extra life or another bomb), and get through each stage without any deaths. It’s in those moments, once you have everything figured out, that the greatness of Resogun’s design becomes apparent, and the game is at its peak when it is most challenging. 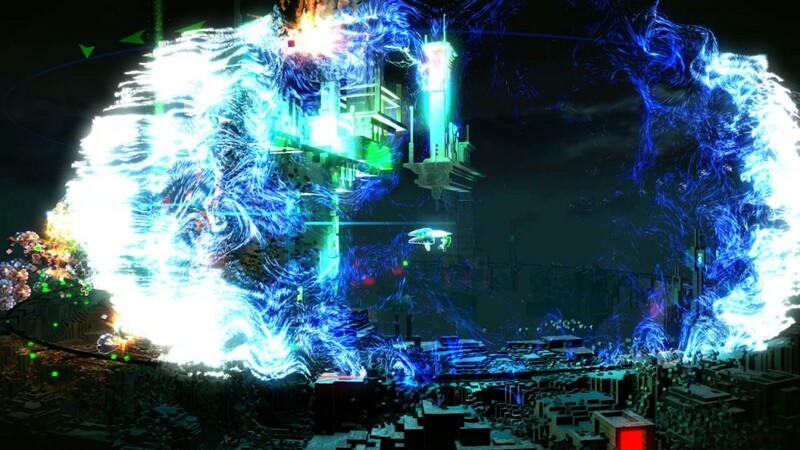 "Despite all of its successes, however, Resogun is not without its failings. 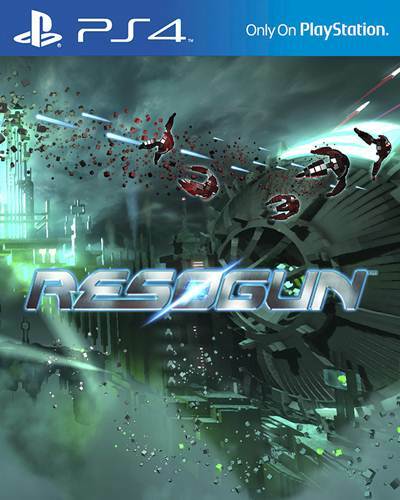 The game only features five stages and three ships, and while each stage is different and each ship plays in a unique manner, Resogun doesn’t feature a whole lot of content." The game’s brilliant design is supplemented by some outstanding visuals. Resogun runs at full HD and features a smooth framerate, but that’s the least impressive aspect of the game’s visual design. The levels and ships are all completely rendered in voxels, and everything in the game, from the levels themselves to the enemy ships, are extremely colorful. Things get even more beautiful when stuff start blowing up. The longer a stage goes on, the more damage the stage takes, and each bit of destruction is accompanied by beautiful particle effects. Of course, enemy ships explode spectacularly as well, and even your more powerful abilities, such as the Overdrive or a bomb, manage to look incredible and convey a sense of power at the same time. All of this is accompanied by some spectacular sound design, but what stands out most is the game’s music, an electric, techno affair that complements the game’s aesthetics and gameplay perfectly, and will no doubt have you bobbing your head in time as you weave between enemy formations. Despite all of its successes, however, Resogun is not without its failings. 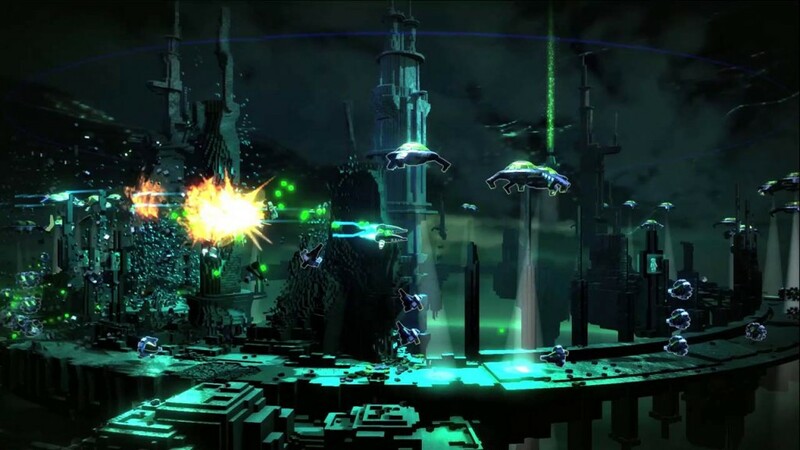 The game only features five stages and three ships, and while each stage is different and each ship plays in a unique manner, Resogun doesn’t feature a whole lot of content. Admittedly, a large part of the game’s appeal and longevity comes from mastering the different difficulty levels, the different ships, and topping the leaderboards, but the fact remains that the levels are short and few in number, and the game’s replay value will be limited in the long run. However, those are ultimately minor complaints against an otherwise excellent game. Resogun is a wonderful way to show what the PS4 can do with downloadable titles, and perhaps most surprisingly, the best first party title to come out of the PS4’s launch. Best of all, it’s currently free for Playstation Plus subscribers. If you’re a fan of shoot ‘em ups, or 2D games in general, you won’t want to miss it. Excellent level design. Fun and varied gameplay. Smooth, beautiful visuals and excellent sound design. Addictive soundtrack that accompanies the game perfectly. A good deal of replay value due to the different ships and difficulty levels. 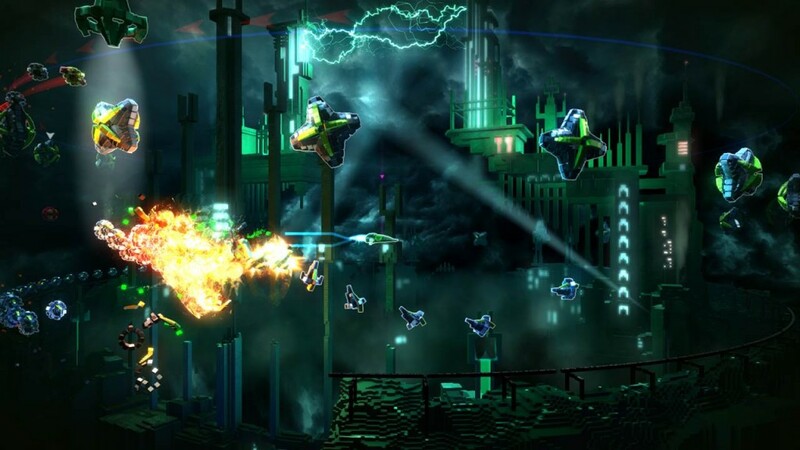 Resogun is an excellent shoot ‘em up and the best launch title for the PS4. If you have the system, you need to get it.